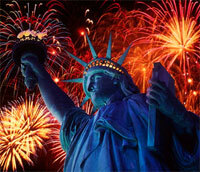 US Holidays 2014 is here to help you plan your holidays in US for 2014. If 2014 is calling for a long awaiting trip to this beautiful country, then US Holidays 2014 is just the thing you are in need of. AstroSages USA Holidays 2014 has all the information, right from public holidays to bank holidays and cultural festivals in different states of US. Plan to be in this country for the biggest holiday of the year, their Christmas and New year celebrations. Use our American Holidays 2014 Calendar to help your with your planning. So, get set and plan your year 2014 holidays in US with AstroSage. Some of the most popular US Holidays are New years eve, Independence day, thanksgiving Day and Christmas day which are clearly mentioned in our USA Holidays Calendar for 2014. The celebrations for these holidays are world famous. People all around the world wish to be a part of these amazing celebrations. The big apple of US which is the New York City is the place everyone wishes to be when the countdown for New year begins to tick. And, with the help of our US Holidays 2014 calendar you can make this wish come true. Planning a holiday trip involves a lot of your valuable time and hard earned cash. Therefore, keep it perfect with the assistance of US Holidays 2014 calendar as planning it for the wrong time would be a total waste time and money. Make use of our American Holidays 2014 calendar and make your planning a smart one. The holidays mentioned in US Holidays 2014 calendar represent the diversity, culture and customs followed by the people in United States Of America. The informations about the dates and the events mentioned in our US Holidays 2014 Calendar is accurate and to the point. Make use of our Holidays Calendar to make your US dreams come true. Plan your US holidays with us using our USA Holidays 2014 Calendar. There are many state wise and citywise festivals, and some amazing carnivals as well, with our American Holidays 2014 calendar you can get informations about this and make your holiday a memorable one. There are few state wise holidays as well, dont let this put hindrance in your holiday plans. Use our Us Holiday Calendar 2014 and cruise the country tension free. Hope our US Holiday calendar satisfies all your need with this we wish everyone a wonderful 2014!